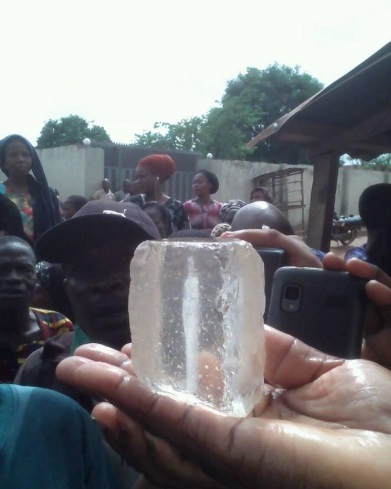 According to an online report, a precious stone with the image of “Jesus Christ” was found at Alagbaa, Wofun area of Ibadan, Oyo state. 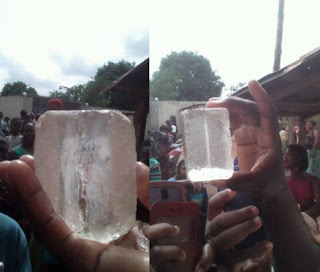 An Ibadan based radio station, Splash FM shared the picture of the said stone as it was also gathered from online users who confirmed the report that the place where the stone is – has been turned to a tourist center – with people gathering in their numbers to see for themselves. One of the walls of a building under construction in the Church was wet, and some people perceived an image on it as that of Jesus Christ, attracting worshippers and curious people. Vanguard reports that the stained wall was first noticed, weekend, by an artisan, who screamed and abruptly stopped the day’s work, claiming he had seen Jesus Christ. 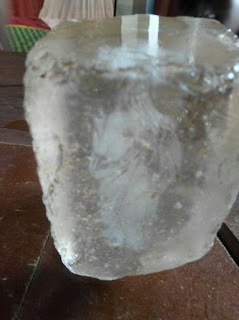 His alarm spread into the neighbourhood and people began to troop into the place. One of the Church attendants said the scene has been attracting over 400 worshippers daily. Yesterday, people visited the Church individually and in groups, praying and singing to God, while some transporters seized the opportunity to hike their fares. People were seen dropping sachets and bottles of water by the wall, while others knelt down or touched the image praying aloud. One of the worshippers, Mrs Adetoun Folajimi, said she came with a lot of prayer requests, hoping that they will be granted soon.